So, as racism is on the rise, people seek examples of anti-racist thought to share. This is helpful! We need models from the past and present to guide us through these perilous times and (let us hope) towards a better future. Dr. Seuss is one of the people who is often quoted and shared. He’s a useful example, although not always in the ways that people think. 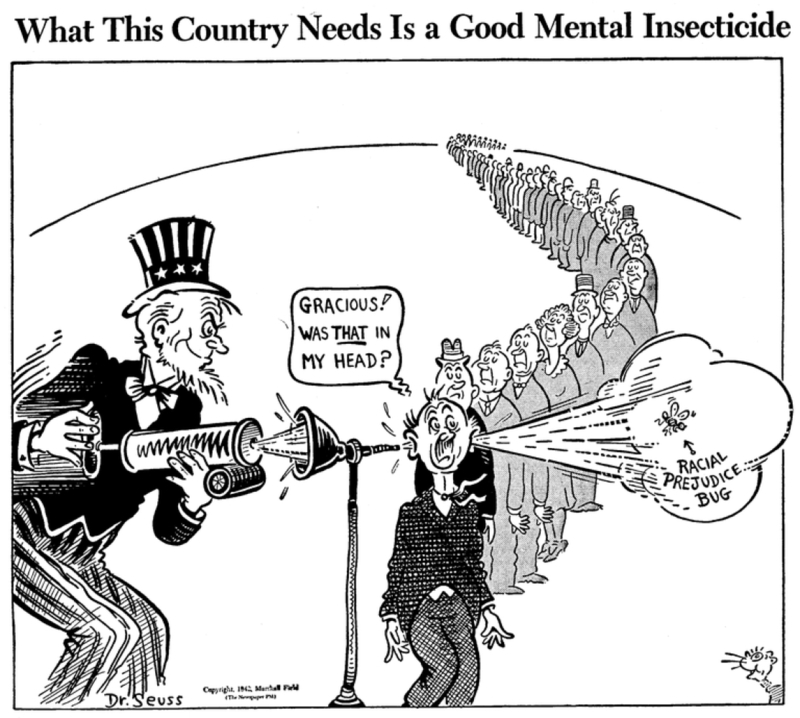 Seuss often gets portrayed as someone whose thinking on race evolved. And to come clean here, I myself am personally responsible for promoting this belief in my earlier scholarship on his work. The problem is that this is only half true: his thinking on race did change, but it also didn’t. This evening, seeing the Seuss “racial prejudice bug” cartoon shared again (in the wake of white supremacist terrorism in Charlottesville) inspired this impromptu Twitter essay. It seemed worth sharing with a wider audience — so, I’ve gathered my Tweets into this blog post. 3. How is Seuss doing both racist AND anti-racist work at the same time? Well, contrary to his cartoon, racism is not a bug. It’s a feature. 4. Racism is not aberrant. It’s ordinary. It’s embedded in institutions, and in culture — such as the cartoons and books of Dr. Seuss. 7. Seuss wrote books actively critical of racism, but his visual imagination remained steeped in racist American culture, & perpetuated it. 9. He wrote the first version of “The Sneetches” (Redbook, 1953), and Horton Hears a Who! (1954) — anti-discrimination classics. 13. Racism is what Raymond Williams would call a “structure of feeling”: it shapes our daily responses to the world, often unconsciously. 14. People—especially, though not exclusively, white people—can perpetuate racism without meaning to & without realizing they’re doing so. 15. Seuss didn’t understand that. And I get why he didn’t understand. Racism conceals itself from its beneficiaries. 16. All whites are beneficiaries of white supremacy, irrespective of whether we want to be. Our unearned privileges remain invisible to us. 18. As beneficiaries of white supremacy, we whites are unwitting accomplices. Our privilege is built on others’ oppression. Period. 19. And that’s why I find Seuss so fascinating—& why I am grateful to @brianjayjones for sharing the cartoon & his willingness to discuss. 20. Seuss exemplifies the sneaky resilience of racism: he’s doing anti-racist work & racist work at the same time. He changes and does not. 24. Racist tropes (even subtle ones) are vehicles for racist ideologies, & influence us without our being aware of what we’re learning. Seuss’s Matilda: Horton’s Ancestor (2 March 2017). Was the Cat in the Hat Black? (22 June 2014). An excerpt from an essay, in which I explore Dr. Seuss’s racial imagination. This is also the title for my new book, published by Oxford UP in this year (2017). You can see the cover and read more about it here. Sarah Begley, “The Hidden (and Not So Hidden) Racism in Children’s Books,” Time 27 July 2017. Sopan Deb, “At the Dr. Seuss Museum: Oh, the Places They Don’t Go!” New York Times 21 June 2017.